Service Provider of a wide range of services which include neemus software solutions pvt. ltd. offers school software and school erp software. Neemus Software Solutions Pvt. Ltd. offers an efficient ,simplified and customized School Management Software. 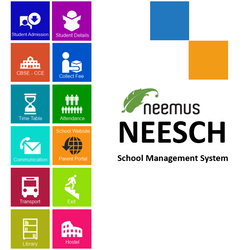 This School Management Software helps in complete automation of school administration and evlaution ProcessThe modules include Admission, Student Details, Fee management , Transportation , Evaluation, Library, Hostel, Bonafide and TC etc. We also take care to customize the software to suit the peculiar needs of schools . Very Easy and Innovative Navigation, Requires minimal training. Adapted and Configured for your school. Online Registration and Admission Process . Assess your children’s progress from home. 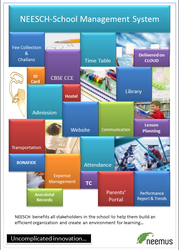 School Management Software system can be accessed from home. Mentoring For weaker students & teachers performance on grade improvement. Sister Nivedita, Pallavi Model, CRPF Public School, Vivekananda Residential School, SNSK, Howard Public School, HTS, Staney Girls, Methodist Degree College, HLSV, HMS, RVK-Sri Vidya, Blue Moon, London Management Academy, Indian School, Kachipuram, Stanley Degree.